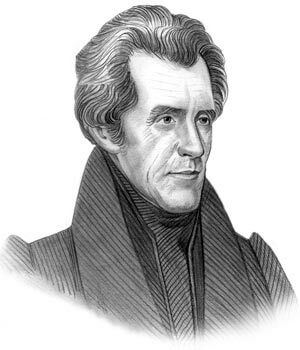 Andrew Jackson was the 7th President of the United States who served in office from March 4, 1829 to March 4, 1837. What was the life of Andrew Jackson like? The short biography of President Andrew Jackson covers important information and facts about his early life, his family, career and the famous events and achievements of his political life. Our short biography of Andrew Jackson provides an interesting and easy way to learn about the life of the President. The following important facts provide a fast overview of important facts about President Andrew Jackson. Facts and Info: Andrew Jackson was the 7th president of America and is considered to be the father of the modern Presidency as he significantly contributed to the expansion of the office. For additional info refer to 20 Facts about Andrew Jackson. Facts and Info: He was born on March 15, 1767 in Waxhaw, South Carolina to a family of poor Irish immigrants. Andrew Jackson’s father died before he was born and his mother and two brothers died before he was 14. Facts and Info: The career of Andrew Jackson included the roles of Lawyer, Politician and Statesman. He became the 7th president of America in 1829 and served for 8 years until 1837. By the late 1830s the Jackson administration had relocated nearly 50,000 Native Americans. Facts and Info: Andrew Jackson married Rachel Donelson Jackson who was a widow with 11 children. He helped raise her children as if they were his own. They lived on a plantation in Nashville in colonial style mansion called The Hermitage. Rachel had previously married Captain Lewis Robards but the divorce had never been completed. Her second marriage to Andrew Jackson was technically bigamous and therefore invalid. Rachel and Andrew Jackson therefore remarried in 1794. Facts and Info: Andrew Jackson belonged to the Democrat Political Party. He was 61 years old when he was inaugurated as the 7th president. John C. Calhoun and Martin Van Buren stood as Vice presidents. For additional facts refer to his Presidential Cabinet members. Short Biography of Andrew Jackson: What he was like! Facts and Info: Andrew Jackson was a tall man measuring 6 feet 1 inches but he was also very thin and never weighed more than 145 pounds. At the age of just 13 years old Andrew Jackson joined the Army to fight in the Revolutionary War. He was known for being both courageous and hot-headed and his temper led him to becoming involved in many duels. Andrew Jackson was the first president to ride on a train. Facts and Info: Two of the important events during his time as president were the start of the Second Seminole War in Florida and the Texas Revolution which included the famous Battle of the Alamo. This brave battle inspired Texas settlers from the United States to join the Texan Army which defeated the Mexican Army. Facts and Info: During his lifetime Andrew Jackson was injured by sword and gunshot wounds. He also suffered from Smallpox, Malaria, Dysentery and Tuberculosis. This range of illnesses was not unusual for this time period as medical knowledge was in its infancy. What is surprising is that he survived these illnesses and lived to the age of 78. Facts and Info: He eventually died of consumption, dropsy and tubercular hemorrhaging on June 8, 1845 near Nashville, Tennessee. He was buried in The Hermitage gardens next to his beloved wife, Rachel. The short biography of Andrew Jackson provides a fast overview of the key facts and events about his life and the accomplishments of his presidential term in office. The following Andrew Jackson video enables you to sit back and listen to the history of his personal and political life - a useful educational resource for kids, children and schools learning about the life of President Andrew Jackson.